Tonight our regular Raw recapper Ian Clark at 8 PM ET covers Raw for Feb. 19th, 2018 -- that's right it's the fourth Raw after the Royal Rumble and the last before Elimination Chamber 2018! Please hit F5 or refresh while the show is in progress for the latest updates. Raw opens with a moment of silence for Parkland. Roman Reigns comes down for the gauntlet match, and Charly Caruso asks about starting the gauntlet six days before Elimination Chamber. He says he's not concerned about tonight, but he is concerned about Elimination Chamber, because he's never been in one, but he's seen plenty. He says the match is brutal, but the level of competition is worse. But he vows to win. Lockup, Reigns presses Rollins to the corner, break, Rollins with a rear waistlock, Reigns reverses by wrenching the arm, Rollins reverses the pressure, Reigns reverses into a side headlock, Rollins whips his way out, Reigns with a snapmare, side headlock, Rollins to his feet, Reigns with a snapmare, side headlock, Rollins to his feet, arm drag, rollup for two, backslide for two, superkick to the gut, staredown, commercial. Back on air, Reigns has Rollins in a side headlock, Rollins powers out, jaw breaker, Roman with an elbow, punches in the corner, whip, Rollins with a boot, Reigns with a tilt-a-whirl slam for two, Rollins with a punch, Reigns with a punch, Rollins with a boot from the corner, blockbuster, slingblade, Reigns presses him to the apron, Rollins with an elbow, springboard forearm, Rollins clotheslines him over the top rope, suicide dive, Reigns blocks with a punch, drive-by, clothesline, clotheslines in the corner, another in the middle of the ring, Superman Punch, reversed into a ripcord knee, blocked with a headbutt, Rollins with a kick to the gut, buckle bomb, Reigns with a Superman Punch, commercial. Back on air, Rollins is up top, misses a frog splash, trading punches, Rollins with a clothesline, suicide dive, another, springboard back in the ring, Reigns hits him with a Superman Punch, calls for a spear, blocked with a kick, Rollins with a spin kick to the gut, Curb Stomp, reversed into a rollup for two, reversed into a rollup for three! Reigns looks disappointed, but offers congratulations. Rollins with a clothesline off the bat for two, commercial. Back on air, Cena has Rollins in a side headlock, cover for one, keeps the hold locked in, Rollins punches his way out, Cena with a clothesline, throws his shirt to the crowd, a dude actually fights others for it, covers for two, punch, whip to the corner, Rollins sells hard, Cena covers for one, chinlock, boot, tosses Rollins to the floor, Rollins breaks the count at 9, Cena with a clothesline, belly to belly suplex, another, a third for two, commercial. Back on air, Cena goes for an AA, blocked, Rollins with a DDT for two, trading punches, Cena with a fallaway slam into a cutter for two, punches, cover for two, trading punches, elbow for two, tackles him to the floor, Rollins beats the count at 9 again, commercial. Back on air, Cena is standing over the prone Rollins, shoulder tackle, another, Rollins blocks a protoplex, Cena presses him to the apron, Rollins with a forearm, springboard, Cena grabs his leg out of midair and locks in the STF, Rollins powers out, Slingblade for two, clothesline in the corner, suplex, goes for a Falcon Arrow, blocked, Cena with a rollup for two, protoplex, You Can't See Me, Rollins kicks him in the face, superkick to the gut, superkick to the face for two, Cena to the apron, Rollins tries to suplex him back in, Cena blocks, brings Rollins to the apron, tosses him into the ring post, charges, Rollins ducks and sends him into the ring post, both men beat the count at 9 but cannot get up once in the ring, Cena with punches, protoplex, You Can't See Me, 5-Knuckle Shuffle without running the ropes, AA, reversed into a rollup for two, Cena goes for a clothesline, Rollins reverses into a crossface, Cena to his feet, AA, Rollins lands on his feet, enziguri, goes up top, frog splash for two, Ripcord Knee, reversed into an AA for two (!! ), Cena goes up top, Rollins with a superplex, into a Falcon Arrow for two, Curb Stomp, reversed into an STF, Rollins quickly gets to the ropes, Cena pulls him up, Rollins on his feet, enziguri, blocked, Cena locks in an STF, Rollins gets to the ropes, drops to the floor, Cena drags him to the top rope, super AA, blocked with elbows, Rollins falls to the mat, Cena with a crossbody, Rollins rolls through, hits Cena with an AA (!!) for two, goes up top, misses a Phoenix Splash, Cena hits an AA, rolls through into a second, Rollins reverses into a Ripcord Knee, superkick to the gut, Curb Stomp for three! Elias covers for two, stomps, knee drop for two, whip, spinning back elbow for two, commercial. Back on air, Elias has Rollins in a half crab, backstage Renee Young asks John Cena how he's reacting to his loss, Cena puts Rollins over, but says that Rollins has only this to focus on, while he himself has several. He reiterates that he has to win to make it to Wrestlemania. Back in the ring, Rollins powers out, boot, Elias with stomps to the leg, stomps to the body, pulls Rollins off the ropes, Rollins lands on his feet, crumples, Elias with stomps in the corner, wrenches the knee, chop, Rollins with a chop, Elias with a chop, repeat, Rollins with more chops, punches, chop, Elias stomps the knee, Rollins hits a superkick for two, both men to the floor, back in the ring, Elias with a boot, knee, Drift Away for three. My god, what booking. This is exactly what Raw needs to be every single week. The crowd gives Rollins a standing ovation. He has been built all the way back up tonight. Elias got a rub by eliminating him but damaged him not one bit. Capitalize, WWE. Elias misses a clothesline, Balor with punches, Elias with a knee, punch, rollup, reversed into a dropkick for two, Elias tosses him to the corner, Elias with a boot, goes up top, Elias to the floor, commercial. Back on air, Elias has Balor in an armbar, boot, snapmare, knee drop to the shoulder, toss to the corner, Renee Young interviews Rollins backstage and asks what he's going to apply from tonight on Sunday, Rollins says he pinned two of the best tonight and that's something, but it doesn't mean anything if he doesn't win on Sunday, back in the ring Elias has Balor in a keylock, body slam, blocked, trading shots, Elias with a shoulder breaker, goes up top, double axe handle, wrenches the arm in the ropes, stomp, pulls him to the apron, tosses his arm across the apron, both men back in the ring, Elias wrenches the neck, keylock, toss into the corner for two, armbar, trading shots, Elias with an arm breaker, forearm, another, Balor with a Pele kick, clotheslines, whip, reversed, Balor with a clothesline, chop, whip, Elias with an elbow, goes up top, Balor with a kick, tosses Elias to the floor, dropkick into the barricade, whip back in the ring, dropkick, Elias with a clothesline for two, electric chair, transitions into a sit-out powerbomb for two, commercial. Back on air, Balor tosses Elias to the floor, running kick to the face from the apron, Elias tosses him into the barricade, rolls him into the ring, knee from the top rope, Balor with a rollup for two, Elias with an armbar, Balor to his feet, tosses his way out, Elias with a boot, arm wrench, blocked with a boot, Balor follows up with a Slingblade, dropkick to the corner, goes up top, Coup de Gras for three. The Miztourage come out, Miz tackles Balor from behind before Balor sees him, punches, kneeling DDT for two, punches, kneeling DDT again for two, cover for two, running knee, another knee, cover for two, whip, knee lift, tosses Balor to the floor, tosses him into the barricade, rolls him into the ring, wrenches his arm in the ropes, arm breaker, commercial. Back on air, Miz has Balor in an armbar, Renee Young asks Elias about entering last unlike tonight. Elias says it'll be like his match against Seth Rollins, not like the rest. Then he vows to win at Wrestlemania. In the ring, Miz beats Balor down, roundhouse kicks, misses the last one, Balor with a kick, punches, running dropkick, Eye of the Hurricane for two, chop in the corner, whip, running chop, whip, running chop, whip, Miz with a boot, Skull Crushing Finale, reversed into a rollup for two, Miz twists the arm, arm breaker, running kick to the face, blocked, Balor with a rollup for two, Miz goes for a Skull Crushing Finale, blocked in the ropes, break, Bo pulls Balor's arm across the top rope, Miz with a rollup for two, Balor with a suicide dive to the Miztourage, dropkick to Miz in the corner, forearm to Axel from the apron, punches Bo, Miz crotches him, Skull Crushing Finale for three. Miz rolls to the floor, Braun chases him to the production area, tackles him, tosses him across the barricade, commercial. 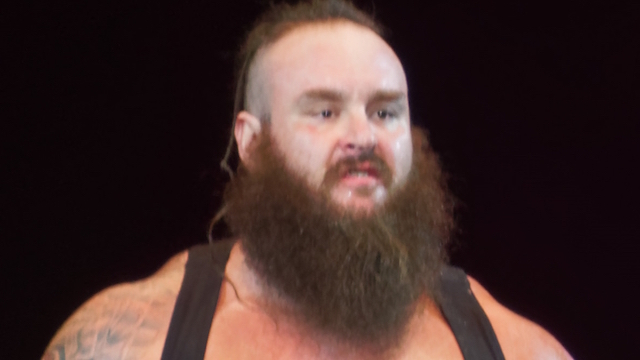 Back on air, Strowman tosses Miz across the ring, then tosses him back across the ring, clothesline, tosses him across the ring again, avalanche, Miz dodges, roundhouse kicks to the gut, Strowman tosses Miz back across the ring, Miz drops him across the top rope arm-first, dropkick, dropkick to the corner, Renee asks Finn about his performance, Finn says Miztourage will be locked out on Sunday, back in the ring Miz hits another two dropkicks to the corner, Braun with a running dropkick to block a fourth, chop to the chest, Miz drops the top rope as Braun charges, Braun to the floor, Miz tosses him into the barricade, Braun with a clothesline, Miztourage circle, Braun scares him off, rolls Miz into the ring, Miztourage distract, Miz hits a Skull Crushing Finale for two, Strowman's kickout tosses Miz to the floor on top of the Miztourage, Miz rolls back in the ring, Strowman with a clothesline, running powerslam for three. Michael Cole points out that, since this was technically all one match, it is the longest match in WWE history. Charly Caruso asks Braun if his mindset will change this Sunday for his first Elimination Chamber match. Braun says he doesn't fear the unknown, the unknown fears him. He says the result will be the same, and then he calls out Brock Lesnar. Then he says he has unfinished business. He runs back into the ring, pulls The Miztourage back in the ring, running powerslam to Axel, one for Bo, chases Miz off. But then Miz comes flying back onto the stage from Gorilla Position, Braun tosses him down the ramp, rolls him into the ring, running powerslam. Then he hits another. Also, during the second part of the match, they confirmed that the seventh man will be reconciled by having three men start off. They show a package for Jeff Jarrett in the Hall of Fame. I am very excited about the potential this holds. In the ring, Renee Young asks Asuka about her match with Nia and the potential consequences if she loses. Asuka: "I control my own destiny. My destiny is to win the championship at Wrestlemania!" "Nia's had some bold words, that she's the only one who doesn't fear me and she's the only one who can beat you." "Very strong words from a very strong woman, but she didn't look so strong in our last match when she was limping away from the ring." "She also said she was going to hurt your pretty face so much that you'll have to wear that mask full time." "Nia does a lot of talking, but this Sunday, she won't be talking. She will tap out!" Nia hits the ring, Asuka cuts her off at the pass, superkick, brawl, Nia takes control, hits a Samoan Drop, leg drop, another, a third to the back. They show a package for Ronda Rousey signing her WWE contract on Sunday. It is 10:23 PM, and Raw is beginning its SECOND match of the night. And yet, it's been one of the most wrestling-heavy episodes of Raw's existence. Cesaro and Titus start off, lockup, Cesaro presses Titus to the corner, chop, Titus tosses Cesaro to the corner, chop, Apollo in, whip, double team elbow for two, Titus in, tosses Apollo into Cesaro, hits a body slam, Apollo in, kick, Sheamus with a clothesline from the floor, tosses Apollo into the barricade, punches, rolls him into the ring, double team superkick in the corner, Cesaro with a chinlock, Sheamus in, arm drag, knee drop, keylock, Cesaro in, top rope double axe handle for two, Sheamus in, stomp, Apollo with punches, Sheamus with a front facelock, knocks Titus off the top rope, Cesaro in, hits the ring post, Apollo knocks Sheamus off the apron, rollup for three. They announce that Matt Hardy will face Bray Wyatt at Elimination Chamber. Backstage, Bray Wyatt says that he hopes the end is near, but the end of Matt Hardy is near. Matt says they've been fighting since the beginning of time. They both call each other liars. And, of course, they both laugh. In a hand-cam promo broadcast during their entrance, Absolution say... something or other. Nothing important. Sonya and Mickie start off, circle each other, lockup, Mickie with an arm wrench, side headlock, Sonya reverses pressure, Mickie with a front facelock, Sasha in, Sonya with an arm wrench, toss to the corner, Rose in, stomp, punch, body slam, blocked, Sasha tosses her to the corner, then the adjacent corner, Bayley in, toss to the corner, cover for one, rear waistlock, Rose with a single-leg, Bayley goes for a triangle choke, Rose flips her way out and shoves Bayley a few times, Bayley tosses Rose to the corner, stomps, t-bone suplex, commercial. Back on air, Bayley elbows out of a Rose chinlock, Rose with a punch, Bayley punches her way out of the corner, punch to Rose, forearms, whip, reversed, Rose catches Bayley trying to leapfrog, tosses her down, covers for two, mounted punches, Bliss in, punch to the back, toss to the corner, kicks, stomps, toss to the corner again, blocked, Bayley tosses her to the corner, punches to the gut, Bliss tosses her to the corner, slap, Sonya in, cover for two, body scissors, blocks a tag, Rose punches Bayley, Sasha in, the ref doesn't see the tag, pulls Banks off while she's beating down Sonya, Rose pulls Bayley around the ring, Rose in at some point in all of that, Mickie in, clotheslines, running boot to the face, kick to Sonya, flapjack to Rose, goes up top, Thesz Press, neckbreaker to Sonya, spin kick to the gut for Rose, boot to the face, off the ropes, Sonya with a trip, Mickie with a kick to Sonya, Rose with a rollup for two, they jockey for position, Rose with punches, Mickie with a kick, misses a punch, Rose with a back suplex, covers for two, Sonya in, punches, avalanche, Mickie with a hurricanrana, Sonya blocks a tag, amateur takedown for two, Rose in, Mickie with a neckbreaker to both women, Bliss in, Sasha in, clothesline, another, dropkick, blocks a kick, hits a kick to the face, presses Sasha to the apron, Sasha with double knees to Sonya, blocks a tackle from Bliss, tosses her into the turnbuckle, kick, goes up top, double knees for two as Rose breaks the count, Bayley with a back suplex to Rose, Bliss with a rollup for two, reversed into a rollup for two, Bliss tosses Sasha into the ring post, Sasha with a rollup, into a Banks Statement, Bliss taps. Absolution attack Banks after the bell, Bayley comes to her aid, takes the beatdown instead. Rose with a knee to Sasha, Deville with a running knee to Sasha, Bliss tries to celebrate with them, Absolution stares her down, Mickie comes in and helps Bliss beat down Absolution, culminating with a double DDT to Sonya. Raw goes off the air with Mickie and Alexa on the same page.